Oslo can be a tough city to find reasonably priced, great accommodation. Would we stay at the Thon Cecil Hotel Oslo again? Probably. Next time though, our pick would probably be the Hotel Saga. While it’s located a few blocks outside of the core downtown area, the hotel looked very nice as we passed by one evening. If money is no object, The Thief would also be worth a try, based upon some of the spectacular reviews. Location, location, location. Thon Cecil Hotel Oslo is the perfect centrally located Oslo hotel. While there are several other Thon hotels in the downtown core (Sentrum) of Oslo , we found the Cecil to be one of the more updated Thon hotels. The Thon Cecil is located less than a block off of the main square in Oslo. You’re within a block of Parliament, less than five blocks to the National Theatre, Culture Museum, City Hall, waterfront and more. Public transportation is close by (bus or metro) and most things are an easy walk to almost anywhere. 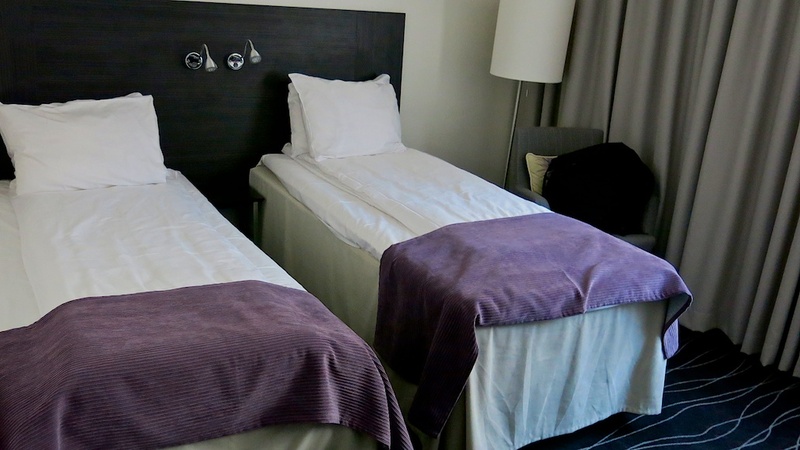 Standard rooms at Thon Cecil Hotel Oslo are on the small side, even by European standards. They’re basic, with smaller sized beds, a TV, small desk area and complimentary internet. Closet space is a at a minimum, but an iron and ironing board are included in the room. Bathrooms are simple, with a single sink, toilet and smallish shower. All rooms are non-smoking. The most disappointing item was the lack of a safe in the room for valuables. Rooms overall were very clean. Ventilation in the rooms isn’t the best. During periods of extremely warm or cool weather, may result in the room being a bit stuffy or cool. Individual control over heat and cold are not possible in the rooms. Rooms facing the interior atrium have limited opening windows. If you want to control the temperature in your room, ask for a room on the street side of the building. The street in front of the hotel has a small amount of traffic, so street noise is reasonable. Two elevators handle all of the traffic for the 111 room hotel, which means during busy times, you may wait a bit longer than normal to access your room. If you get a room on the second or third floor, it’s an easy walk up the stairs. Service here is very friendly and the staff is attentive and knowledgeable about the area. There is a computer and printer available for guest use in the in the lobby, as well as a Nespresso coffee machine. While the hotel does not have a restaurant, a nice European style breakfast with both hot and cold food is available on the second floor in the hotel atrium each morning. They’ll even pack a take away lunch for you if you ask. Pros: Location, location. Easy access to everything in Oslo Sentrum. Clean rooms, great staff. Cons: As the seasons change, finding adequate heating or cooling in your room can be a challenge.